A high school honors student who grew up in foster care just received a generous -- and shocking -- gift. 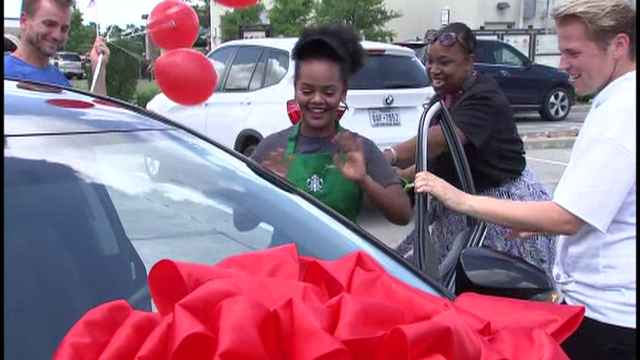 On Wednesday, a stranger surprised her at work with a brand new car. The stranger is Charlie Jabaley, a Grammy winner and former manager for rapper 2 Chainz, who has left the music industry for a profound mission: "Dream Machine," a project for giving back. Jabaley surprised Sionna Brenn while she was working at a Starbucks in the Houston area, Fox 26 Houston reports. Brenn is a senior on the honor roll at Willowridge High School who took the job to help support herself. She came to the U.S. from Ethiopia at 9 years old, and her life in the U.S. has not been easy. She says she was abused by her foster family, but overcame her struggles through her faith in God. Brenn was eventually removed from the home. She found a distant cousin she did not know in Houston, and moved there. Since Brenn had no legal guardian at the time, she was considered homeless by the state, a representative for Dream Machine told CBS News. Despite her misfortune, Brenn worked hard in school and received a scholarship to the University of Texas at San Antonio. She dreams of becoming a dentist. Jabaley heard about Brenn's inspiring story and wanted to help. Just like Brenn, Jabaley is also determined. The former music industry insider was diagnosed with a brain tumor more than a year ago. He decided quit work to follow his dreams. One of those dreams was to get fit and he says he has lost 130 pounds so far. But his story of determination does not stop there. Jabaley founded the Dream Machine Tour. He and his friend, Scotty Cams, are riding their bikes across the country and stopping in cities along the way. At night, they stay in a brightly painted bus they've dubbed the Dream Machine. While on their travels, they seek out people to help, like Brenn. Jabaley made what he calls a "manifesto" video about the Dream Machine project in April. "In order to make a change in the world... you have to get out there in it," he wrote on YouTube. "People need help, not only during holidays or special occasions, people need help now. I'm challenging corporations, celebrities, and anyone with a voice... come be a part of this journey with me!" At first, Jabaley used his social media platform to chronicle his weight-loss journey and inspire others. He always dreamed of becoming an athlete, and so when he became fit enough, he decided to embark on this bigger journey. On April 22, he and his friend set off on their bike tour. Their goal is to ride from Los Angeles to New York City, stopping en route to do good deeds for those in need. "I had enough of the negativity and polarization... It's time for something positive!" Jabaley writes. They have already helped a woman in Arizona who was diagnosed with cancer. They paid off Rose Esparza's home mortgage and medical bills and are also buying the teaching aide a new car, CBS affiliate KPHO reports. After that, they made their way to Texas. They stopped in a few cities along the way, having meet-ups with fans who signed their Dream Machine bus. Then they stopped in Houston, where they had their sights set on helping Brenn. In an Instagram story, Jabaley is seen first buying the car for Brenn. "We're about to buy the car for the young lady here at Toyota... and we're going to surprise her at Starbucks." Then, Jabaley made his way to Brenn's place of work. Brenn was taking out the trash, completely unaware that anyone was there to see her. Jabaley hid behind a dumpster and as Brenn walked by, he jumped out with a big bouquet of balloons in hand. Someone filming from afar captured the big reveal. Brenn was shocked, and fell to her knees. Once she got over the shock, Brenn walked over to the car with him. "This car is yours," he told her. She began tearing up when she saw the new Toyota Corolla, decorated with a big red bow. "It's more than a dream. It's crazy," Brenn said. The Dream Machine funds their good deeds with help from sponsors, such as Vero, which they describe as "a next generation social media platform." Jabaley also uses his own money, his representative told CBS News. They chose their "dream" recipients from a pool of submissions. People around the country can share their stories and dreams on the project's website. "I think I'm in a dream right now," Brenn said before adding her signature to the Dream Machine. On the side of the bus, she wrote that her dream is to "Reach the world with the gospel of Christ."